Following the test done by ASEAN NCAP on the standard variant of Mitsubishi Triton, which received a 4-Star rating, ASEAN NCAP decided to compare the result with higher variant tested by Australasian NCAP (ANCAP). This particular variant is offered as an option for selected ASEAN countries and it is fitted with 7 airbags compared to other ASEAN variants fitted with only 2 airbags as standard. Furthermore, Electronic Stability Control (ESC) is also offered. The Triton model of higher variant that was tested by ANCAP in March 2015 scored a very good result of 15.22 points for its Adult Occupant Protection (AOP), which is in the 5-star range. However, it did not perform well for the Child Occupant Protection (COP) rating with only 2-Star (48% compliance). The ASEAN NCAP crash test for the Triton that was done in April 2015 on the other hand, received a 4-star rating with 13.56 points out of 16 in AOP, and a similar two-star 48% score in COP. 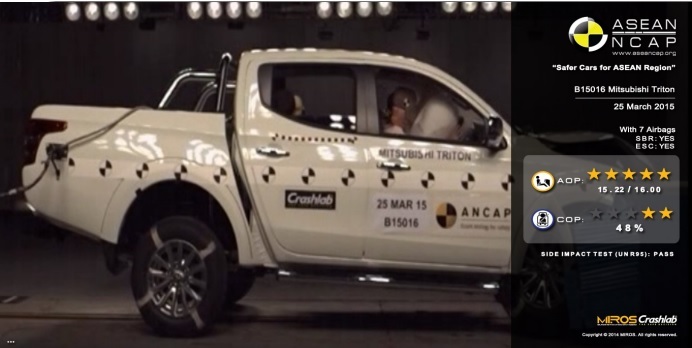 As mentioned earlier, the reason why the results differ is because the Australian-spec Triton that was tested in ANCAP had 7 airbags in total, as well as an Electronic Stability Control. This high-spec variant is also available in Thailand but with only 2 airbags as standard. Meanwhile, the high-spec Mitsubishi Triton VGT Adventure A/T 4×4 that’s currently available in Malaysia comes standard with 2 airbags, Anti-Lock Braking System (ABS) and Anti-Lock Braking System (ABS). ASEAN NCAP further compares the result with other pickup trucks in the market and the premium variant of Triton AOP score of 15.22 (5-star) lead the rating of pickup trucks, with Chevrolet Colorado at 14.19 (5-star) and Isuzu D-Max with 11.87 (4-star). Nevertheless, in COP, Triton obtained the lowest score between the three other models with only 48% compliance (2-star) while Colorado and D-Max had a higher score of 63% (3-star) and 71% (4-star), respectively.